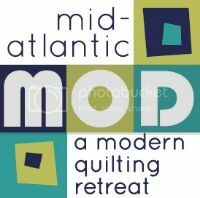 Philadelphia Modern Quilt Guild: Introducing Susan of the Village Quilter! Even though we're called the Philly Modern Quilt Guild, we all know that most of the time NJ is included in the Philly area. And that's a great thing for all of you quilters located in New Jersey, because this week's shop is in your neck of the woods! Read on to learn more about The Village Quilter. When did your shop first open its doors? What made you decide to start the shop? After careers in insurance sales & the window treatment industry, I was given the opportunity to start a new quilt shop in the quaint Mill Race Village (www.millraceshops.com) section of Mt. Holly. My parents would have said, retail was my destiny. At the age of 8 I set up a card table in my front yard & sold potholders to all the neighbors. Does your shop offer classes? If so, what types? We have a full range of classes that change quarterly. From beginners classes in Machine Piecing Machine Quilting, Hand Appliqué, & Paper Piecing. Moving on to more intermediate classes in quilting, clothing & purses. Our clubs have also been very successful. We recently have added Jo Morton’s Little Women Club and Terry Atkinson’s Groovy Girls Club that have 3 full sections! We also have a nice variety of Block of the Month Programs. These programs allow customers to pace themselves financially & time wise in completing a large quilt over a longer period of time. Do you have sewing machines in the shop? Long arm quilters? We have 3 local long arm quilters available to our customers. Two work at the shop part time & all 3 ladies are on call to meet customers at the shop 7 days a week. We also have 2 Bernina’s in the classroom for use during class or club times. Is there any particular supply you’re partial to? Even though we are a small shop, we are very eclectic in our fabric offerings. Marcus Fabrics, Timeless Treasures, Westminster, Blue Hill, MODA, Free Spirit and Andover seem to be our staples. What’s unique about your shop compared to others out there? Our location! Just 2 miles off Exit 5 of the New Jersey Turnpike & nestled in the heart of Mill Race Village with plenty of parking! Mill Race Village is an eclectic group of shops anchored by one great restaurant The Robin’s Nest. The shop has become a destination quilt shop. Our customers often combine a trip to the shop to pick up one of their Blocks of the Months with lunch at The Robin’s Nest. What’s your vision for the shop in the next 2+ years? Another expansion! Plans are moving forward for a 1000 ft addition in the spring 2011. Anything else you’d like to mention regarding the shop? I am blessed with an awesome staff & a very talented group of teachers! Both, but finding the time is a struggle! How did you get started sewing/quilting? I started sewing when I was 8. A babysitter taught me to make clothes for my Barbie. I started quilting in 1986 under the tutelage of Jessie MacDonald. The people! My customers, my staff, and my fabric reps. I have made such wonderful relationships with so many great people in this industry in all parts of the world. Just like our customers……finishing all the projects we start! Do you name your projects or label them? I try and label everything I give as a gift. I love to cook & play in my garden. I hope to sit still enough someday to learn how to knit! Thanks so much for taking the time to answer all my questions, Susan! Best of luck with the shop and congrats on the planned expansion!! Also, this concludes our shop spotlights! Hope you all enjoyed learning about the women behind the shops and maybe found a new one close to you. I'll be back to doing member interviews on the next round. See you then!